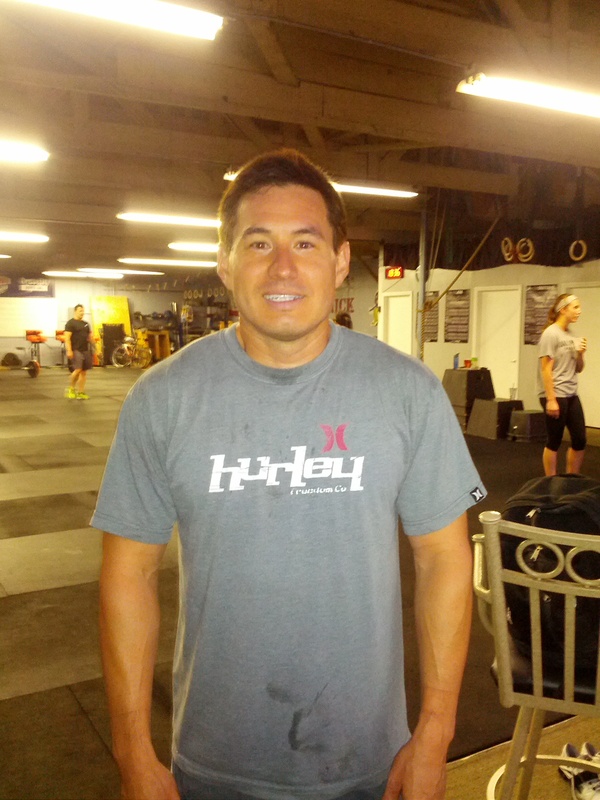 We get it, CrossFit can be a tad intimidating to the uninformed and the inexperienced. Especially so when all you know of the amazing strength and conditioning program are the incredible athletes and the scary-hard workouts you see them doing at the CrossFit Games on ESPN2. Well, good news folks. I’m here to tell you that’s not what CrossFit is all about. Most people will never reach those fitness heights, nor will they ever aim to. What CrossFit is about though is pushing your own personal limits. It’s about being better than you were yesterday and proving you’re capable of any challenge that stands in your way. It’s about ordinary people doing extraordinary things. Those are the kinds of wonderful members we have at our gym, so why not get to know them better. The CrossFit Kinnick family has been growing so quickly, and most members tend stick to their favorite time slot, that not everybody gets to meet each other. So…meet Robert! A brief history: I grew up in Virginia Beach, the youngest of 4 (sister, step-sister, step-brother). My dad was in the military so I also lived in Belgium when I was a kid. I moved to California to go to law school at Pepperdine and I’ve been here ever since. Work: I am a transactional attorney for a real estate development company–as such I am not at a firm and I never go to court (well, almost never). I specialize in real estate law and deal with commercial loan issues, landlord/tenant law (residential and commercial), land acquisitions and dispositions, fair housing/employment discrimination, and generally anything else that comes across my desk that no one wants to deal with. Kids: No human kids, but I have a black lab that is awesome and very low maintenance. Hobbies: I like woodworking, building stuff, backpacking (although I don’t get to that often), and anything in/on the water–as long as it is warm water (I am an east coast boy who is used to the Gulf Stream keeping the ocean warm). I also enjoy traveling. I’ve driven cross country 3 times (once by myself), traveled all over Europe, and I’ve been to Japan a few times. I like going dove hunting and shooting targets. Athletic background: sports? Not so much–it’s pretty evident when you see how quickly I become exhausted. I like skiing (water and snow), completed a good month at Flexx Labs, and once ran a water ski program at a Christian Camp in North Carolina in between my junior and senior year of college. Globo gym? It’s like an alien planet to me. I felt so lost so I never really went. Crossfit: I found CrossFit at the end of January 2011–I’d heard about it from a co-worker who talked about it as this “crazy work-out place” he visited and how he was sore for days thereafter. I Googled locations close to work, interviewed Jeremy (he passed the normal test) and I decided to come check out CFK for my “free” visit. It was then that I realized CrossFit is for me. I like CrossFit because I’m told exactly what I need to do and we are trained in how to do it–we are not just left to flounder on our own and make all kinds of dumb mistakes (although we still manage to make some when we don’t listen). Plus, you get to meet a tons of girls like Fran, Diane, Helen, Barbara, Angie, and the list goes on. Seriously though, there really is a sense of family at CFK. I am constantly encouraged by the people there–it’s awesome. Lifetime goals: Get married and have a family. Favorite movie: I don’t really have a favorite movie. I like going to movies, being entertained, and then I typically forget about them. For those of you who don’t know, Robert was born without middle knuckles in his fingers. It makes grabbing a barbell, pull-up bar, and rings incredibly difficult, but that hasn’t stopped him from doing some pretty amazing things. In his nearly 2 years with us, Robert has back squated 315# and successfully performed a muscle-up (no easy task, I assure you). You’ll typically find Robert in the 6am class 4 times a week. If you happen to cross paths with him be sure to say “hi”. You won’t regret it!